You love the look of hardwood flooring but not the price. You'd really like to add some elements of natural stone flooring to your kitchen but it's not in the budget. Do either of these challenges sound familiar? When it comes to flooring, we all want the best look possible for our money. So how do you get the look you want for the price you can afford? 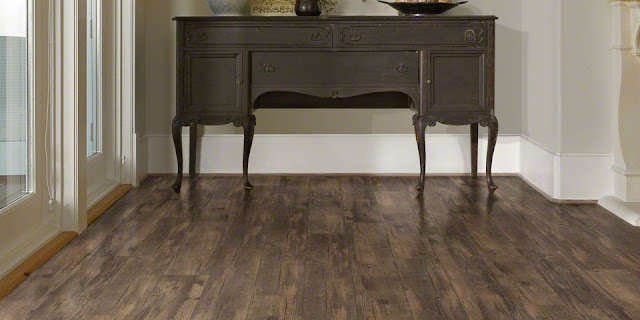 If you're looking for budget flooring, check out luxury vinyl tile. Don't be scared away by the word vinyl in this product! Vinyl is the material that this flooring is made from but it looks nothing like traditional vinyl flooring. In fact, luxury vinyl planks or tiles (not those long rolls or sheets you might be picturing) look so much like the floor they are designed to match that many people have to get down on their hands and knees to see the difference. Luxury vinyl tile - often called resilient flooring - is created using high-definition printing on the top layer. The resulting tiles and planks have a look that’s highly authentic and designed to emulate the top species and colors of hardwood as well as a variety of fossilized wood, stone and concrete visuals. Luxury vinyl tile gives your home the look of high-end flooring without the high-maintenance or installation requirements. It's budget flooring with a look that's far from cheap. Extremely durable, easy to clean and waterproof, luxury vinyl really is the perfect floor for any room in your house. It’s particularly popular for basements, kitchens and bathrooms because of the waterproof qualities. And because it’s softer underfoot than traditional hardwood or tile, it’s comfortable whether you’re standing in the kitchen cooking dinner or entertaining in your basement. Stone: Resilient tiles that carry the visual attributes of natural stone. Wood: Resilient planks that mimic the appearance of hardwood but with easier maintenance.